We were proud to help host the Governor General of Canada, David Johnston, who visited Tsinghua University of China in July. Mr. Johnston had the opportunity to stop by the School of Environment's Drinking Water Safety Laboratory, which aims to address the key technology problems in drinking water safety applications and was established in partnership with Trojan Technologies. The team at Tsinghua focuses on research and applications of UV disinfection and advanced oxidation, and is also responsible for helping promote the treatment of drinking water via UV disinfection in China. 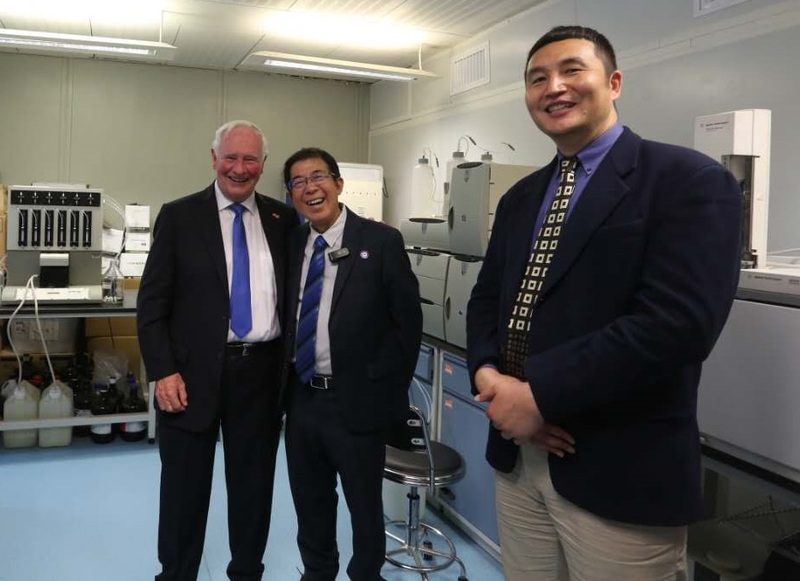 Governor General of Canada, David Johnston (left), Professor of Drinking Water Safety at Tsinghua University, Wenjun Liu (middle), and Trojan's Dongming Lu at Tsinghua University's School of Environment's Drinking Water Safety Laboratory. Director of the Drinking Water Safety Laboratory, Prof. Wenjun Liu, introduced the history and the research work of Tsinghua-Trojan partnership. Mr. Johnston praised the cooperation and hoped to see further collaboration between Tsinghua and Trojan Technologies, expressing his hope to see the center do more to improve the quality of China's drinking water. In China, the use of ultraviolet light is an established method for the disinfection of treated wastewater before it is discharged back into lakes, rivers and streams. TrojanUV alone has supplied UV equipment to hundreds of wastewater treatment plants throughout the country. Highly favorable reviews of UV technology in wastewater applications influenced Tianjin Economic Development Area (TEDA) Water Supply to investigate the potential of using UV for drinking water applications at one of its Tianjin water treatment plants.